QATSIF was created to give Queensland's Aboriginal and Torres Strait Islander families increased educational choices and life opportunities. It is an independent, not-for-profit trust managed by The Public Trustee of Queensland and operates through a small Secretariat. The funds used by QATSIF for its programs and activities are drawn from the interest earned on the original capital provided to The Public Trustee to establish the Trust. Built from the labour of Aboriginal and Torres Strait Islander Queenslanders under now-repealed laws, preserving this capital means the toil of previous generations will have a direct benefit to the generations that follow. In this way, QATSIF will always stand as a permanent and positive legacy for the future. QATSIF has a Board of Advice to make recommendations on how funds should be used to achieve QATSIF's objectives. The Board is comprised predominantly of Aboriginal, Torres Strait Islander and non-Indigenous people who are experts and leaders in their fields, including youth affairs, education, government, corporate, philanthropy, community affairs and finance. The Board of Advice recommends allocation and prioritisation of QATSIF funds, giving it a strategic role supporting Aboriginal and Torres Strait Islander education in Queensland. It also partners with the wider community, private sector, philanthropic organisations and educational and financial sectors to create opportunities for young Aboriginal and Torres Strait Islander Queenslanders to promote both equity and cultural awareness. to ensure the income produced is unending, and to secure additional financial support from the wider community for the Trust and the objectives it seeks to achieve. While the income is used by QATSIF, the original amount given to The Public Trustee of Queensland to generate that income is preserved. Those funds represent the toil of previous generations of Aboriginal and Torres Strait Islander Queenslanders who laboured under now-repealed control laws and policies. It was drawn from two sources: $10.8 million from the former Aborigines Welfare Fund and $15 million from the remaining unspent funds from the Indigenous Wages and Savings Reparations Scheme. In recognition of the significance of these sources, the Trust Deed provides that this initial capital must always be preserved and identifiable separate from any income or future donations. Never before have I witnessed so many Aboriginal and Torres Strait Islander students keep faith in their education. Aunty Ruth was born in Mitchell, Western Queensland, in 1929. Her mother and grandparents (deceased) were descendants of the Gungurri People of the Maranoa District. After the family’s move to the Cherbourg Settlement in 1930, Aunty Ruth was removed from her mother and became a “dormitory” girl. Twenty-one years later she married a Cherbourg man, Joe Hegarty Junior, and together they raised eight children there. The Hegarty family left Cherbourg in 1966 and since that time Aunty Ruth has become a respected Elder working tirelessly to improve the way of life for Aboriginal people. In the 90s Aunty Ruth’s life took a new turn when her memoir “Is That You, Ruthie?” was awarded the prestigious David Uniapon Award. “Bittersweet Journey” - the sequel to “Is That You, Ruthie?”- was published in 2003. More recently Aunty Ruth self-published “Jack’s story: The life and times of a Cherbourg Dormitory Boy”. Now, in her eighties, this respected Aboriginal Elder continues to volunteer her time to the Binambi Barambah Aboriginal Organisation cultural camps started by the Hegarty family 18 years ago. Aunty Ruth is an author, an activist and an educator and was publicly recognised by the Queensland Government when, in 2010, she was added to the list of Queensland Greats for her tireless campaigning for a fair go for her people. Professor Shannon has made a significant and extensive contribution to health policy including working on maternal, foetal and infant health in Aboriginal and Torres Strait Islander communities including dealing with difficult issues such as drug and alcohol abuse and homelessness. Professor Shannon brings to the Board her experience in the community sector and views of Indigenous people in rural, remote and urban settings. She has extensive networks throughout Indigenous communities and within the government sector. Her understanding of the needs of education and the broader supports required to achieve employment and self-development outcomes is evident. Jane is an Aboriginal woman with cultural and traditional connections to Far North Queensland. Through her mother’s and father’s connections, Jane is of the Wulgurukaba and Yirrganydji peoples. Jane has worked with a diverse range of teams across key stakeholder groups including Aboriginal and Torres Strait Islander community members to build and sustain effective partnerships and networks. She was appointed to a leadership role at Australian Catholic University in August 2012 and from December 2012 became the Acting Director of the Centre for Indigenous Education and Research. 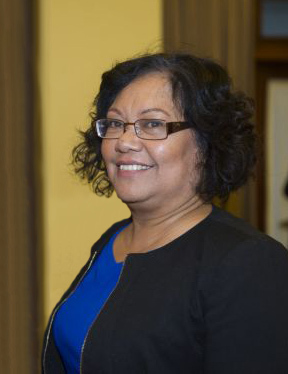 She was appointed as Director, First Peoples and Equity Pathways Directorate, ACU in December 2014. Mark has worked with privately owned and publicly listed companies in Queensland, New South Wales and Victoria, as well as closely with Government for more than 20 years. He is a broadly experienced manager with strategic and operational experience in the technical, consulting, human resources and not-for-profit sectors. He has visited and engaged with a number of Aboriginal communities, particularly on Cape York since 2004 and seeks to contribute towards improved educational outcomes and the growth of the Foundation. With a desire to improve employment outcomes for young people from both Aboriginal and Torres Strait Islander and non-Indigenous backgrounds by balancing Secondary, Vocational and Tertiary education, he also maintains a strong focus on corporate governance and appropriate process, most recently working as a Director and Board Chairperson of the Queensland PCYCs. Claire is a Brisbane based barrister. Prior to being called to the Bar, Claire acted in a range of significant commercial and property-related disputes for various national and multinational corporate clients. In 2014 Claire was appointed National Pro Bono Coordinator for Norton Rose Fulbright. In this role, Claire was responsible for developing and managing the firm’s national pro bono program, with a particular focus on pro bono initiatives targeted towards providing legal assistance to members of the indigenous and refugee communities. In 2013 Claire was named one of the Top 30 Lawyers Under 30 in Australia, and was also named one of the 50 rising stars by the legal industry publication Australasian Lawyer. Claire holds a Bachelor of Laws (with Honours) and a Bachelor of Arts from the University of Queensland. Jim Walker was born in Rockhampton and is a descendent of the Iman and Goreng Goreng peoples of Central Queensland. He has extensive experience in working for both Queensland and Australian government departments and agencies. His work has included policy and program formulation, analysis and evaluation. Up until January 2015 Jim had worked for more than 7 years in the Office of Indigenous Engagement within CSIRO and in this position his responsibilities included increasing the engagement of Aboriginal and Torres Strait Islander trainees, cadetships and internships in science. Part of these responsibilities also included encouraging Aboriginal and Torres Strait Islander students to take up studies in Science and Mathematics with the aim of increasing participation of Aboriginal and Torres Strait Islanders in science careers. As part of his career, Jim has also been engaged as a lecturer at the University of Queensland, the Australia Catholic University and the University of Canberra in Indigenous Studies. Kellie McDonald is a young Aboriginal woman whose Mob is Mandandanji from Roma. She was a QATSIF Scholarship Recipient in Round 2. After graduating from Alexandra Hills State High School, Kellie completed a Bachelor of Health, Sport and Physical Education degree at the University of Queensland. She is now a teacher at Alexandra Hills State High School as well as the Indigenous Coordinator. 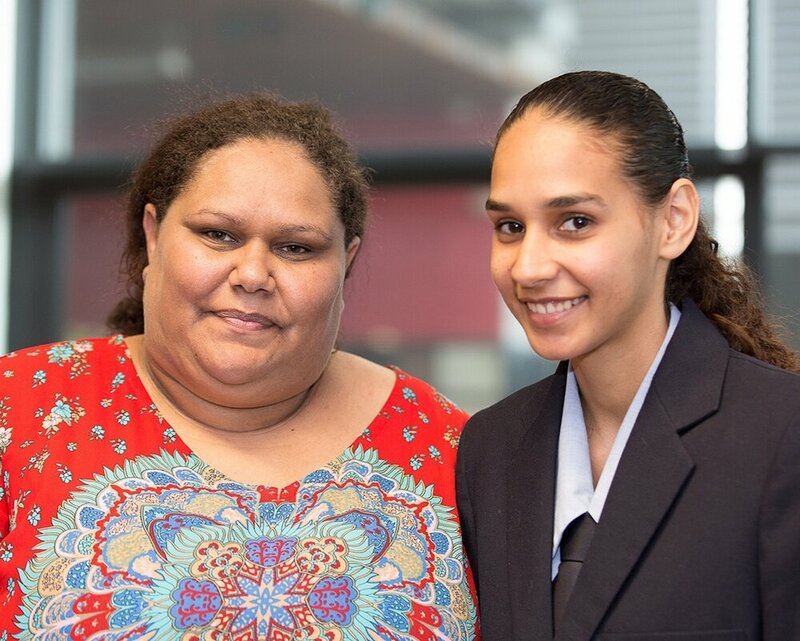 Through her commitment to education, Kellie continues to motivate, educate and inspire Aboriginal & Torres Strait Islander students to improve their academic results, cultural knowledge and overall physical and mental well-being. QATSIF is very grateful for the ongoing support and great work of the Public Trustee of Queensland who provides financial and human resources support to QATSIF. QATSIF works hard to ensure that our students receive the maximum benefit from QATSIF funds. The artwork was developed by artist David Williams, Gilimbaa . This is the story of the artwork as described by Mr Williams. The overall tone of the artwork, created through its gentle shades, reflects the delicateness and sensitivity of the topic of the stolen wages, and the reason for the creation of the Foundation. The two main colours, blue and ochre, represent land and sea, which represent the two people that were affected by the stolen wages and the journey they have taken. The blue river, travelling from the bottom left of the artwork, represents the past - the history of the stolen wages. It also represents the formal acknowledgement of this past. This path takes the form of water, a fundamental element of life for Torres Strait Islanders, and also for Aboriginal people, and leads the eye to the central element of the artwork. The central element, the white circle, represents the Foundation, and the present. From this core, sections of warm ochres and blue (representing Aboriginals and Torres Strait Islanders) radiate outwards. These sections represent the multiple paths of opportunities and positive outcomes that are created by the Foundation. The thick white lines that border the past and future pathways are boundaries, both constraining the path of the past and broadening to open up the future. The pale brown lines that connect the pathways of opportunities represent the strengthening of bonds between individuals, families and the community as a result of the ripple effect of the benefits of the Foundation. The blue sections of this opportunity represent not only Torres Strait Islanders, but water as the source of life. This depicts the power of the Foundation to be instrumental in creating positive change on a large scale. The sections to the top left and bottom right of the artwork, with their earthy tones, represent different areas or regions, thereby including and representing Indigenous people from all areas of Queensland and the Torres Strait. The faint brown lines that traverse these sections again represent the ripple effect of the results of the Foundation providing opportunities not just for young people who receive scholarships and bursaries but for the community on a wider scale.